I couldn‘t figure out which of my four garage cats had learned how to pry the lid off of the cat food bin. 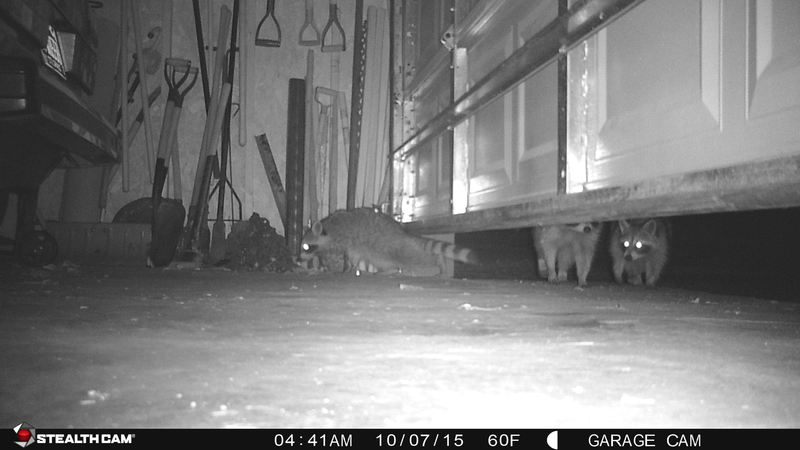 So I purchased an inexpensive trail camera to allow me to see what was going on in the garage during the night. When I fed the cats this morning and saw the cat food bin lid on the floor, I couldn’t wait to check what photos the little camera had taken. Imagine my surprise when the photos revealed that my garage has been repeatedly invaded by THREE raccoons! My poor cats–I’m surprised they haven’t run away from home. (Oh wait, the heated cat houses and full feed bowls are good motivation for not running away from home.) But geez the neighborhood sure has gone downhill. Meanwhile, my attempts to trap the previously unknown culprit(s) failed miserably. Every morning, the trap was sprung and the bait gobbled down. I have no idea what I’m going to do now, except keep the garage doors shut at night. That means that any garage kitties that haven’t come in by 10PM will be stuck outside until morning. With cold winter temps just around the corner, that will be a concern. 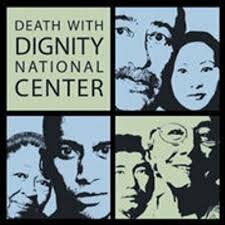 As a member of the Death with Dignity National Center (http://www.deathwithdignity.org), I was asked what inspired me to support the cause. Some members have experienced the agonizingly slow death of a loved one and were motivated to become involved to help others. That is their story. Here is my story. I haven’t had much experience with death. Up until last year, I really hadn’t lost anyone I was close to in my 61 years of living. My beliefs about death were formed by being raised on a farm. Death is a natural part of an animal’s cycle on a farm. Livestock are bred, and born, and butchered. Good farmers make sure that each of those events is managed with respect and compassion for the creatures in their charge. Family pets are not allowed to suffer if mortally injured on the farm or if the quality of their lives is so diminished by age that the kindest thing to do is to put them down. As an adult with my own small farm to manage, I placed high priority on two things: giving the animals in my care the best life that I am capable of providing them; and guaranteeing them a good death. I employed humane slaughter practices before they were the popular choice, making sure that my animals never suffered during the harvest of their meat. My pets’ health was always a top priority and I was raised to never shrink from the painful decision to euthanize when necessary. As I entered my 50s and began to formulate a plan to manage my senior years, I realized that I had no caretaker who could be counted on to secure for me the same quality of death that I have spent my life providing for my animals. No one who could mercifully put me out of my misery when my living was done. I have been tremendously successful in managing my entire life, but I quickly realized that there was very little I could do to manage my death. In good health and at age 50, I purchased two helium tanks and required paraphernalia to simply have on hand in an effort to ease the worry I felt about losing my sovereignty and autonomy were I to be incapacitated. I have no spouse or family or close friends, so if I can’t provide for myself, my quality of life will be in serious jeopardy. I created a legal environment that would help others care for me and advocate on my behalf for a quality death. I’ve created medical durable powers of attorney and video-taped myself stating my frame of reference and how I would like to die. I’ve placed in prominent areas around my house do-not-resuscitate orders and contact information where to send my body in the event I die. I’ve got all conceivable bases covered. But there is absolutely nothing I can do to make sure that I have a good death. And there is nothing I can do to help someone help me have a good death. I can’t even ask friends to listen to me talk about these things lest they be placed in legal jeopardy. Mere mention of self deliverance risks being labelled suicidal and perhaps carted off to the state sanatorium. I have accepted the fact that in all likelihood I will die alone. That is okay as long as I die well. Right now, there is no guarantee of a good death. My involvement with Death with Dignity and other similar groups is simply insurance that I can at least contribute to what I hope will eventually be positive change in our country’s inhumane treatment of people wanting to no longer live. I still have a lot of life in front of me, and I plan to pack every day of it full of joy, and curiosity, and delight. But not a day goes by without the niggling worry that I might have to endure unimaginable atrocities prior to death that my country’s politicians will inflict on me in their quest to remain electable. I was raised to treat all living creatures as I would like to be treated myself. I fear that no one will be allowed to do the same for me. That’s my story. The good people at the National Center want to hear from you. What’s your Death with Dignity story? What inspired you to support the cause? What does Death with Dignity mean to you? This entry was posted in Philosophy and tagged Death with Dignity on August 14, 2015 by eweforia. 3.5 minutes of jaw-dropping awesomeness. Puts everything in a totally different perspective. This entry was posted in Philosophy on July 16, 2015 by eweforia. I can “hope” that as I get older I don’t get Alzheimers or have a stroke or suffer any of the afflictions that cause pain and suffering or loss of autonomy. I can hope. I’ve always been ridiculously proactive about things. From the time I was a little girl, my parents taught me to make my own future; put into place now the foundation for events that I’d like to have happen in the future. It’s how I got to Africa when I was 16; how I purchased my own house before I was 35; how I owned my own business at age 40. Those events didn’t happen because I “hoped” they would. They happened because I laid the foundation for each of them and actively worked to build on it. Hope is not a plan. I do my best to keep healthy, but I cannot control what may ultimately “do me in.” There is a host of chronic, progressive physical disabilities that I may succumb to (COPD is what I live with now), most involving intractable physical pain. To simply hope that I die a good death isn’t a good plan, especially since the odds don’t favor it. But it is a basic human right to choose to end one’s life when a person judges the quality of their life to be unacceptable. This right by its nature implies that the ending of one’s life is one’s choice, including the timing and persons present, and should be free of any restrictions by the law, clergy, medical profession, and even friends and relatives no matter how well-intentioned. To the extent that I can increase the likelihood of dying peacefully, with dignity, with autonomy, I need to lay the foundation now and build actively on it as I grow into my senior years. I educated myself about ways to end my life peacefully and with dignity. The best resources can be found in the book Final Exit: The Practicalities of Self-Deliverance and Assisted Suicide for the Dying and the book Five Last Acts – The Exit Path:The arts and science of rational suicide in the face of unbearable, unrelievable suffering (click images to link to Amazon). 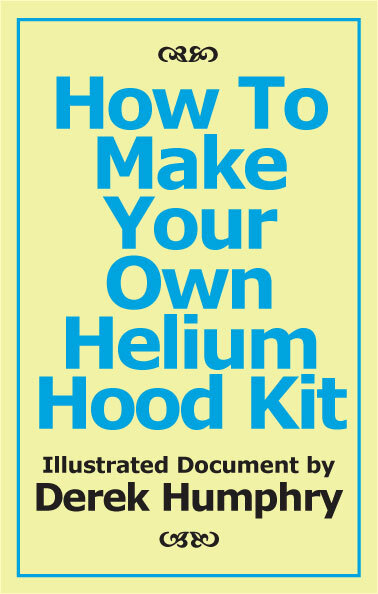 I purchased the helium tanks and other equipment that are required to end my life using helium. Two or three breathes of helium in the absence of oxygen will cause immediate unconsciousness and cessation of life shortly thereafter. Other less complicated methods require drugs that cannot be legally purchased in the U.S. or a trip to Switzerland or establishing residence in one of the few U.S. states that allow physician-assisted death. I joined the Final Exit Network (http://www.finalexitnetwork.org/). In the event I have a terminal illness, they will provide a compassionate person to be with me if I choose to end my life before the suffering makes it intolerable. I have been surprised at how having a good plan reduces the stress of worrying about something I can’t control. I am in no way suicidal; I enjoy my life, and every day brings a beauty and spiritual grace that gives me joy. But like all long-term goals, part of the process of getting there is adjusting one’s attitude and thinking. Americans are unwilling to talk about their own death or even think about it. I talk about my plan to a lot of friends, and I can see that although they respect my right to feel the way I do, they are uncomfortable hearing me talk about it. Just as my parents taught me to lay a good foundation for my life, they have always been open and forthright in talking about death and their plans for their own deaths. They’ve involved me in the preparation of several drafts of their wills; in their choice of donating their bodies to Science Care (http://www.sciencecare.com/) for medical research, education, and training; and in discussions about their eventual funerals. So it is not surprising that I have the tools I need to help me prepare for my own death. I have a plan and it gives me hope. This entry was posted in Philosophy on February 2, 2015 by eweforia. Nothing of importance is lost by change. From the 1988 movie The Dawning starring Anthony Hopkins and Jean Simmons. Why is this important? Seven words make such a powerful statement. Just think about those words for awhile. And it was a really good movie.